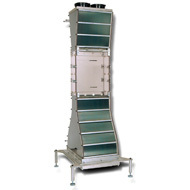 The CWT-106™ is a research quality wind tunnel designed for multiple PCB and component level testing. It is used in air flow characterization and flow visualization, thermal resistance measurements and generation of P-Q curves. The large test section (24 x 24 x 6") is designed to accommodate multiple PCBs as seen in a typical ATCA chassis. The wind tunnel can also be used to characterize different heat sink sizes for natural and forced convection cooling. Multiple heat sinks can be tested side by side to determine their thermal performance in the same environment. The CWT-106™ produces uniform air flows of up to 6 m/s (1200 ft/min). Air is drawn into the tunnel with up to five variable DC fans mounted at the exhaust section of the tunnel. These fans are mounted on a tray and can be easily replaced with another tray to accommodate larger or smaller fans, should different air flow ranges be required. An internal flow management system, with honeycombs and screens, breaks up turbulence and provides uniform and homogeneous flow in the test section. The CWT-106™ can be operated both vertically and horizontally and features a Plexiglas™ test section for ease of flow visualization. The CWT-106™ includes 18 sensor ports in front and on the sides of the test section for the insertion of a variety of probes, such as thermocouples, Pitot tubes, velocity measuring sensors, etc. PCBs are mounted on a flexible railing in the test section. The flexibility of the movable mounting plate allows users to design and build their own modifications to suit specific needs. The mounting plate can be adjusted in two directions using appropriate length standoffs.